The first stage of the cognitive or learning process is obtaining information. After you obtain information, you can continue the cognitive process to varying levels. For example, you may perform basic cognitive processes by taking in information and simply storing it in your memory for later recall (remembering). You may also perform higher levels of cognitive processing such as reasoning, evaluating, and synthesizing the information. You obtain information from the environment around you. Since many events occur simultaneously in the environment, you cannot process all that information at once. What you obtain will depend on what gets your attention. If the stimuli does not come to your attention, you cannot process it. If the stimuli does get your attention, you will take information into your brain for mental processing. This mental processing may be affected by both your perception and intuition. You cannot pay attention to all of the stimuli in the environment all at once. Therefore, you use selective attention to focus on those stimuli relevant to your current interest. What gets your attention is controlled by what interests you. Hence, it is your interest that starts the process of obtaining information. Your interests can be thought of as an influential stimulus that draws your attention to a particular thing, person, or activity. Once something draws your interests and gets your attention, you begin to form perceptions. Perception is the way sensory information is transformed so it has meaning. Perceptions are based on past experiences, education, values, culture, self-concept, expectations, preconceived notions, and present circumstances. Some people rely on their intuition to help them obtain and process information. Intuition is the ability to understand something without any conscious reasoning. It is a knowing or believing something with no rationale. If you are interested in something, it will gain your attention. The more attention you pay to something, the more information you will obtain. However, the opposite is also true. If you are not interested, you will pay less attention and thus, obtain less information. 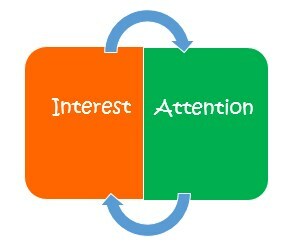 Attention and interest are often thought of as the same, however, they are two distinct factors. Interest is feelings that arouse attention to someone or something while attention is your mental focus. 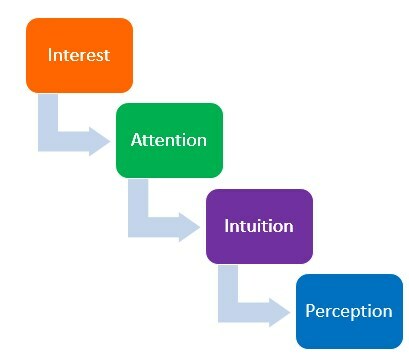 Attention and interest are interconnected. Your interest determines their attention. Thus, if you are interested in something, you will pay attention to it. Likewise, in order to pay attention to something, you have to have interest in it. These two factors are also mutually dependent, since what captures your attention is your interests which can only be satisfied if you pay attention to it. After you pay attention to a particular stimulus, you take the sensory stimuli from the environment and send that information to your brain to continue the cognitive processes required to interpret the information. As you interpret information, you begin to make perceptions about that information. Perception is an unconscious process where you take in sensory information from your environment and use that information in order to construct your own version of reality. Intuition can also play a role in the obtaining of information. Intuition is the ability to acquire knowledge without the need for conscious reasoning. It is instinctive knowing without the use of rational processes. Perception is organization, identification, and interpretation of sensory information. Once sensory input starts, you use perceptual processes to select among sensory input and organize that information in your brain. You perception may be created on logical reasoning based on your past experiences, education, values, culture, or present circumstances. Intuition, on the other hand, is immediate thought or feeling without the use of conscious rational processes. It can be thought of as unconscious perception. It has nothing to do with your experiences. It is a knowing or believing something with no rational explanation.